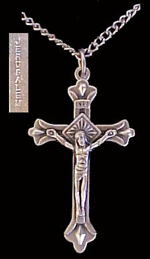 Holy Land Crosses that are listed here are all exquisitely made Christian jewelry with attention to detail. This beautiful jewelry recognizes the strong Christian - Jewish/Israeli friendship based on our common Judeo-Christian heritage. This gorgeous jewelry from Jerusalem comes in a wide variety of styles. They are all quality products made by native artists from Bethlehem and Jerusalem who have developed their craft over many generations. We hope you enjoy these inspiring Crosses. Each time you wear one of these fabulous pieces of jewelry, it will feel as if you are carrying a piece of the Holy Land itself, the land where Christ walked! This gorgeous necklace comes in brilliant colors and shapes of blue, green, pink, purple, gold and every color in between. An 18" Sterling Silver chain is included with this beautiful Mother of Pearl Cross. Attractively gift boxed with a 20" Stainless Steel Chain. This is a beautiful detailed Crucifix engraved with the word "Jerusalem" in the back. A simple unique gift for both men and women. Cost is $12.99 plus shipping and handling. Gorgeous highly polished Sterling Silver Jerusalem Cross filled with sparkling Cubic Zircon stones. A stunning gentle luster!! If you wish to add a little shimmer to your jewelry case, consider these beautiful Jerusalem Cross pendants. These are attractively gift boxed with a description "About the Jerusalem Cross". The Jerusalem Cross also known as the "Crusaders Cross" or, the "New Jerusalem Cross", focusing attention on the Divine and heavenly restoration of Jerusalem. The large center Cross symbolizes the person of Christ. It is surrounded by 4 Crosses symbolizing the belief that Jerusalem is the spiritual center of the earth and Christ's commandment to spread the Gospel from Jerusalem to the four directions of the world, a mission that started in Jerusalem. A unique gift with much symbolism! This artistically designed necklace is made of high grade Sterling Silver and comes with an 18" Silver Chain. To purchase click here.